Battlefield V received today a brand new update, which introduces support for the Firestorm battle royale mode as well as some gameplay tweaks and enhancements. The new update, which is now available for all versions of the game, introduces some big tweaks for air combat as well as several vehicles, weapons and specialization fixes. Catch the full update notes below. Flap Scaling has been tweaked to give less maneuverability at speeds under 200 kmh. Drag Coefficient is now less extreme at 90-degree angles to remove “floatiness” at low speed. Going slow will now more heavily impact your ability to maneuver your plane. Drag Coefficients for elevators and rudders have been separated out and tweaked to get a more physical stalling behavior as in nose down faster when stalling. Drag over velocity tweaked per plane to max out at cruising speeds. This means that planes will retain energy for longer and not slow down as fast. Gravity will affect planes more when climbing. Combined with drag changes, this makes it more viable to trade altitude for speed. The player is no longer clipping with the machine gun on the M3 halftrack when viewed from a third person perspective. The throwing grenade animation will now properly play when throwing grenades while in the passenger seat of vehicles that support it. Players can now fire the rocket launchers while in the passenger seat of a vehicle that supports it. Players should no longer get crushed when exiting the Universal Carrier at steep angles on hills / uneven terrain. Fixed some visual issues that would occur when using the Field Drab paint job for the Valentine Archer tank. The Valentine Archer tank now properly shows that it’s using APDS rounds instead of MG rounds in the user interface. It is now possible to repair the Valentine Archer tank’s engine once it gets damaged. Fixed a bug which could trigger the enter vehicle animation when a player pressed theexit vehicle interaction button too many times. Player are now ejected out of towables should they end up in deep water. Airplanes will no longer collide with medical pouches and crates, which could causeaccidents. Fixed a bug which would cause players to trigger tank sights while in a Universal Carrier. Players can no longer damage the PAK-40 with small melee weapons such as knives. Fixed an issue where players could be immune to damage during a small window of theanimation when moving between in-vehicle and the top gunner seat. Players will now die if they exit a plane at the moment it gets destroyed, previously insome cases you would survive exiting while the plane just had started to explode. Fixed an exploit related to the resupply stations for vehicles. The “Camera Roll” option now works with the Blenheim planes. Fixed an exploit that enables players to use tanks during the “waiting for players” phase. New damage curves have been implemented for all large and medium bombs. Thesecurves now give more predictable damage levels depending on proximity to a target. This change affects both armor and infantry targets. Additionally, some direct hit damage present on some bombs has been moved to the explosion damage in order to achieve better damage consistency. The 75mm and 6 pounder cannons on airplanes have had their explosive damage reduced to approximately equal the effectiveness of the BK37 Stuka cannons in damage per second. With a substantial number of additional bombs available to these planes the high damage output of the cannons was simply over-performing. The trail effects for rockets have been substantially improved to help in tracking the rockets both for the shooter and for victims. The maximum explosive radius of the GR21 rockets has been slightly reduced to better balance them against RP-3 Rockets. The GR21 only needs to fire two rockets to get maximum damage, and the lethal killing range of these weapons was more effective than balanced. The small bombs equipped on the BF-109 G2 can now be dropped together to allow both bombs to land closer to their target. This should enhance their effectiveness against infantry and make them a good choice against the GR21 rockets for that tree. The 4000 lb. Blockbuster bomb has had a significant reduction in blast damage, but retains in impressive blast range. Additionally, the large bomb has significant drag, making it slower to reach the ground when dropped. This bomb is an area weapon designed to devastate a large amount of structures, vehicles, and infantry. For balance purposes it’s important it reliably damages a large number of targets over a large area without outright killing all of the targets. The 250 lb. bombs dropped by the Spitfire VA can now also be dropped together for asimilarly greater effect on target. These bombs have also received a slight boost to their blast damage against infantry, as previously, a single bomb was unable to kill a full health soldier in a reliable manner. This is a change for consistency, and should not greatly increase the potency of the weapons. Reduced the splash damage of the Bordkannone 37. Fixed vehicles so that they take the correct consistent damage to the top and bottom of the tank. Reduced the damage of the Valentine AA’s Canister shot so it takes a few shots to kill. With 40 rounds and a good rate of fire it should not reliably one-hit kill infantry at mid-range. Increased the armor of turrets on medium and heavy tanks. These are now harder to destroy. Adjusted the STUG and Panzer default HE shell trajectory to be slower initially but retain speed over distance better. This returns the howitzer feeling of this shell without making ranged hits significantly more difficult than other tanks. Adjusted the PIAT for the new tank values. It now has the proper blast damage for infantry kills, but has over all a slightly reduced damage. The AP Mine’s blast damage has been reduced below a one-hit kill again, with a new damage curve model giving a reliable flat damage amount out to the edge of the blast’s effective range. Adjusted the damage done to parts by explosives like mines and dynamite so they do not instantly destroy parts upgraded via the spec tree. Added a new AT Mine and dynamite damage curve. Mines and dynamite do very good damage if stuck to or triggered by a vehicle, but rapidly drop off if detonated only near the vehicle. This also makes the lethality against infantry good only at very close ranges and then reduces to a large wounding radius. Fixed an issue where weapons would not gain full accuracy quickly enough whenzooming in and not using iron sights. FG42: Reduced base horizontal recoil to 0.5 (was previously 0.525). The FG42 was a bittoo uncontrollable for its small magazine. Sturmgewehr 1-5: Reduced reload threshold to 0.78 (was previously 0.82) to bettermatch the reload animation. This means you can switch to a different weapon a bitearlier without aborting the reload. Semi-automatic rifles: Tweaked recoil decrease and recoil per shot. The weapon typenow has more and longer felt recoil. Numbers are not directly comparable to older versions of the game. Polished Action: This Specialization now provides a stronger effect on the first shots to make it a better choice. Fixed a bug which would cause Sticky Grenades to self replenish sometime after using anammo crate. Fixed a visual bug that would appear when picking up the Bren gun with an allied Medic that has The Phantom equipped on their torso slot. Throwing ammo and health pouches have been improved in those cases where they would sometimes be standing close to other objects. Melee attacks now properly does damage when both players are in deep water. Improved the V-1 Rocket explosion when directly hitting water and when hitting really close to players. Fixed a bug where players sometimes would still see a certain gadget in their hand, while the functionality was for another gadget. Fixed a visual issue with the ZK-383 where a bullet was visible through the body of the weapon when using ADS with the iron sights. Made additional minor improvements to bipod placement on certain objects. Fixed a bug which caused weapons to not reload properly, after players had climbed on top of a vehicle while reloading. The Reinforcement binoculars will no longer float if the player has them equipped and does a slide. The Kar98k will no longer show the wrong number of bullets inserted during a reload animation after the player has placed the spawn beacon and the last bullet has been fired. Fixed a bug where the walking animations would stop updating if players walked over certain obstacles while crouch-walking. Improved ground detection to prevent transitioning to falling state when crawling under a low object. Fixed a bug where a movement animation would be played when standing still. Improved vaulting through certain windows on Narvik. In Combined Arms, the end-of-mission slow motion effect will now only trigger during the last three seconds of the mission timer. The Combined Arms mission details screen will now properly show which map it takes place on. The Tides of War screen on the end-of-round screen will now always show the descriptions for each node. The player can now choose whether to hold or press button for request/skip revive when down via a new control option. Screenshot resolution is now affected by the resolution scale setting. For example, if you take a screenshot at 1920×1080 with resolution scale set to 200%, the resolution of the screenshot will be 3840×2160. Multiple crash fixes and stability improvements. Made performance improvements in Combined Arms. Improved NVIDIA DLSS image clarity at 4K and 1440p. The specialization and customize buttons have been added to the Replace Weapon screen. Made previously implemented vault activation improvements to work on 30hz servers. The specialization and customize buttons have been added to the “Replace Weapon”screen. Made past vaulting activation improvements to also work on 30hz servers. On a related note, some new Firestorm gameplay has emerged online. You can check it out by going here. 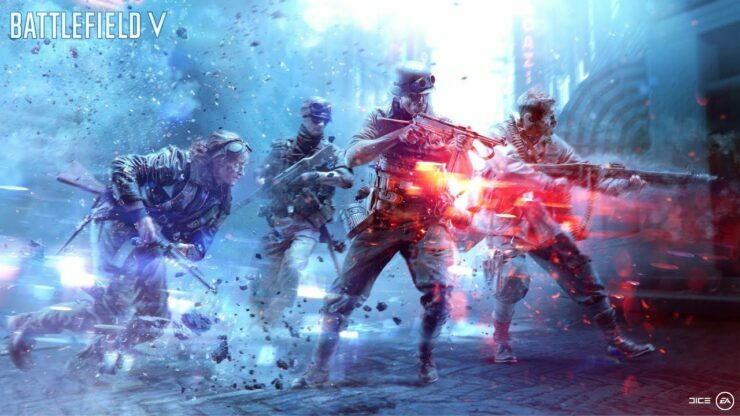 Battlefield V is now available on PC, PlayStation 4 and Xbox One in all regions.